Here we are again at another anniversary of the pogrom in Sri Lanka known as ‘Black July’. The violence was a harbinger that dissipated Tamil life in the city of Colombo especially, and to the generation of that my father. It escalating a brutal war along with triggering an island-wide mass migration of Tamils for 30 plus years is history. My father’s generation was an important component and formed a significantly affluent presence in the other ways also diverse as Tamils living in Colombo. The generation of my father, having been born in the north during pre-independence Ceylon or shortly thereafter, then notably in vast numbers moved to Colombo. There they built their professional education/career/entrepreneurship, family, indulging in the arts and spiritual part of their enriched lives. And they are diminishing in number in the capital city nowadays. Early on they began exiling the isle of Serendipity in the aftermath of July 1983 and now the natural law too creeping upon with the inevitable reality. This is a sombre countdown as those with first-hand experiences of that saga of Tamil life become non-existent and now it will become another abstract memory etched in this world. Their life churned through living under different constitutions, a linguistically different official Language Act introduction, putting down roots and growing a family… only to see separation from their loved ones in their golden age. My father’s generation sought stability and attained a fulfilling life despite signs of instability clawing into the mainstream a few years after the British Empire handing over the reign to the ethnicity belonging to the majority inhabitants of the isle. However, in their professional lives and beyond, in dedicated contribution of the chosen field to belonging to the city and society at large, my father’s generation never compromised their values along ethnic lines. They forged a lifetime of friendship not only with their Tamil colleagues from other Tamil areas of the isle but also across ethnicities. Their perseverance and esteemed citizenship gave us, their next generation, a cosmopolitan life and the encompassing exposure to diversity before stepping out of Sri Lanka, though personally I didn’t realise the value of these environs fully while living there. My father left home from his native village in the wee hours of a morning as a 21-year-old leaving to the hustle and bustle of the capital city, leaving behind his four other siblings and parents in their quintessential home. The ancestral nestling sits on the edge of Mudaliya Vayal (Mudaliya paddy field) in Madduvil-North, a village in the township of Chavakachcheri in Jaffna peninsula. He left the place in possession of their generational credentials in sticking to traditional Tamil values and admiration to apply the lingering English work practices in their careers. The July 1983 violence short-circuited their life in the capital and their hope for retirement in the north. It also unexpectedly ended spending life in golden years near their children and or other extended families and friends in close proximity. The July 1983 incidents were the third such occurrence for my father’s generation, and the most severe in the city and country they called home. My father faced a life or death situation only on the first of the three major attacks against Tamils, during that first one in 1958. 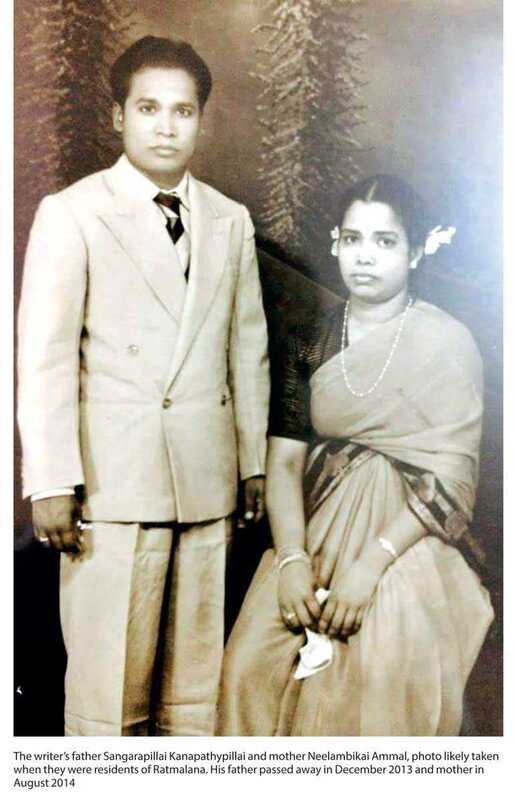 My parents were living at that time in Ratmalana. This town apparently was a much-sought-after idyllic enclave by Tamils at that time. This town is probably the only centre shade providing tree-lined section in all of Galle Road, the main thoroughfare in the city. I recall my father (we called him Pappa), saying that Ratmalana was urbanised to the vision of the then Prime Minister Sir John Kotalawela. Sir John held office until in 1956 and then the years saw violence unleashed on Tamils, majorly in 1958, but there was no shade from the violence to scores of Ratmalana Tamils. Scores were burnt to death in Ratmalana and neighbouring towns. My father said he slept in nearby bushes of manioc plants and fortunately my mother was temporarily in her ancestral home in Kalvayal, a village in the same township of Chavakachcheri at that time. Pappa was presumed no more until he arrived there weeks later. This shattering only after a decade of Ceylon’s independence didn’t prevent a sprawling perseverance for Tamil arts, religious life, institutions and periodic festivities that sprung year after year. Tamilness thrived in Colombo in every aspect as much as in the Tamils’ cultural capital of Jaffna in the north or Batticaloa in the east. Tamil arts flourished within schools and outside, there were popular drama and theatre, publication of Tamil novels, then there was the across the Palk-Straits popular Sri Lanka Broadcasting Corporation Tamil Service, a small but much appreciated Tamil film industry, the Tamil pop song scene and so forth. Employees of a few of the Government ministries hosted Tamil Art festivals, notable among them and growing in popularity year after year was ‘The Navarathri’ celebrations by the Customs Department officers. Newspapers Thinakaran, Virakesari and Sinthamani delivered exemplary journalism. The merchant scene was spectacular. From eateries, to wholesale commission agents in Pettah, printers, sari palaces and jewellery boutiques glittered commerce. The city centre of Pettah and the commercial establishments were studded with pockets of piety belonging to all four faiths. Wellawatte, which has now become the number one enclave for Tamils, had three popular book stores selling English and Tamil titles; Daniels, Rizwi and Vijayalakshmi book depots interestingly were run by Tamil speakers of three different faiths. This perhaps was coincidental, nevertheless they reflect the character of the city suburbs at large. The Ramakrishna Mission in Wellawatte was the venue for numerous festivals along with its spiritual presence, a children’s park and an invoking library too by the Wellawatte shoreline. The Vivekanada Society in Kotahena conducted grade level exams in Hinduism and the Tamil Methodist Church on Moor Road Wellawatte was iconic and they still are. The Vivekanada Society in Kotahena was even admired as better functioning than its peers in India by writer Priyadarshi Dutta of Kolkata during Swami Vivekananda’s 150th birth anniversary in 2013! The 1977 violence on Tamils and the 1983 pogrom spared us out of simple luck and a vigilant neighbourhood of non-Tamil ethnicity. Our destiny would have been devastatingly different today had there been loss of property and or life to our family in July 1983. Since 1970 our family was nestled in Dehiwala at the seaside home custom built by my parents. Mercifully it still stands through the 1977 and 1983 troubles as the neighbourhood was home to a senior officer in the Army belonging to the Burgher community. 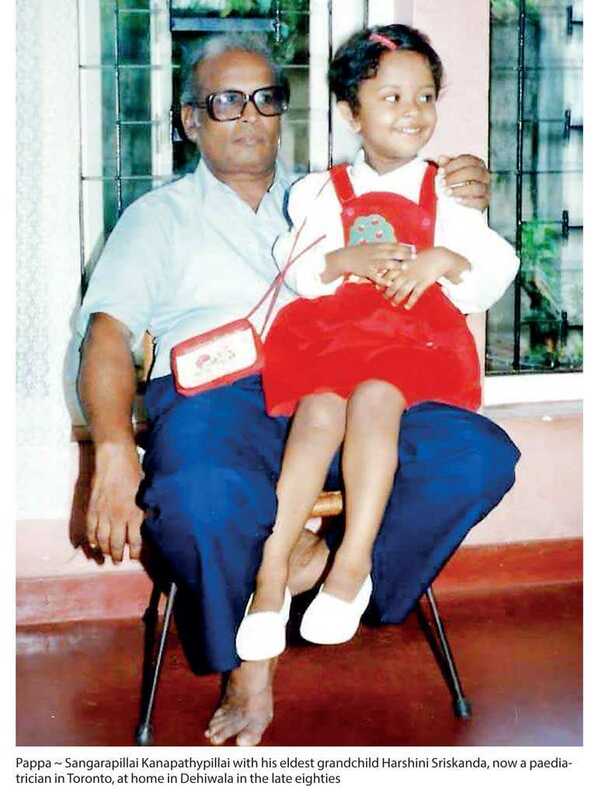 In July 1983 the Army officer’s family opened their doors, especially to Tamil children, ladies and also other Tamils in the neighbourhood, to spend nights or anytime in their premises whenever they felt they needed added safety. Furthermore the rolling hooligans were prevented from coming down our lane by Sinhala Municipal workers known to us and more Sinhala folks at their usual hangout spot of a nearby ‘dara maduwa’ – firewood shop. I used to take ‘pongal’ sweet rice for them after celebrating Thai Pongal right out our front porch. This ‘dara maduwa’ is also no longer there after more urbanisation. The house was doing fine but I along with my brother-in-law of six months left home on the morning of that Monday, 25 July, to a vehicle dealer in Orugodawatte in Colombo North not realising the nature of the day ahead. We decided to walk to my father’s office located within the old Parliamentary complex at Galle Face, the seaside promenade of the city. It wasn’t that we were brave, but only opted for walking without realising the unfolding horror all around. We safely completed a terrifying walk seeing burning cars and passengers being pulled and dragged from buses en-route to Galle Face. But my father had already left the office and was given protection to safely reach home. We were held up in the Parliament building over a couple of nights until we were taken home after the curfew was lifted. The situation remained unsafe for anyone to move about; yet my forever courteous friend Dr. Thushara Rodrigo from the same 1981 batch as I at D.S. Senanayake College, dropped by at our house one day during this week in 1983 to checkout our wellbeing. The violence continued unabated for several days and on Friday, 29 July, it was at its peak. It was called ‘Koti Dawasa’ meaning ‘Tiger Day’ with rumour mills working that armed Tamil youth were in the city. Many Tamils died that day and there were no verified reports of armed youth. I seldom discussed Tamil nationalistic politics or any ethnic biases my father encountered in-depth with him at home. His most noted quip about any political settlement for ethnic matters as far back as I could remember to his passing away is, “They won’t give anything,” meaning no devolution of power would be forthcoming. Growing up in Dehiwala, I remember he would subscribe to one English, and one Tamil newspaper every day and multiple newspapers on Sundays. He never brought home nor have I seen him reading ‘Suthanthiran,’ meaning the firebrand Tamil journal of nationalistic politics. But he would regularly read Saturday Review that was edited by Gamini Navaratne and published from Jaffna, he liked the good journalism of this newspaper. As a Director of the General Treasury, he very much liked Minister of Finance Ronnie De Mel over any other Cabinet minister while there. I also gather that he highly appreciated the manner and politics of leaders Colvin R. de Silva, Dr. N.M. Perera, Pieter Keuneman and Bala Tampoe. From an earlier tenure with the Ministry of Health, he would recall profound memories of working under Minister Siva Obeysekera. Apart from primarily working in Colombo, he also would relish working briefly in Ratnapura. His interaction with any Tamil leader of the times was with TULF leader Appapillai Amirthalingam, regarding his dealings as the Leader of the Opposition with the Treasury. My father retired in the late 1980s, moved to Toronto in the early 1990s and passed away in December 2013. In the year following ‘Black July’, at the same age my father left his home in the north, I too left Sri Lanka at 21 and never had to live through the rough and tumble of the horrendous war and repercussions in the country we called home. This year’s passing added adding yet another milepost, as I am at the age of 55 today, just a year older than my father was in 1983. Nowadays at every turn I tend to recollect the age of my parents to plot its relevance to the chores of my own life. Some of the global or personal upheavals of the day make me anxious about what the future holds, perhaps to a degree of worrisome levels. But then I am part of the global Tamil diaspora scattered far away from our ancestral habitats. Likely forever I will miss the glory of living in my ancestral homeland in the north just as my father also saw this dream evaporating. Historical currents in the Indian sub-continent have moved people far across the globe, as far as the Caribbean two centuries ago. Workers in the tea estates of the central hills in the isle of Serendipity, though nearby, a historical event of those times such as the colonial rule shipped them away from their native villages in India. Like theirs, ‘Black July’ too now fades into the memory of time, especially for those of us who left the shores. These make me think I am a tiny dot amongst humans living outside of their homelands, uprooted willingly and unwillingly in the course of history. But only those generational first-hand stories can vividly portray the times and perspectives of those lives prior to the calamities or the real desire to relocate from their homelands. Sooner, this will apply to my generation as well!